Good. Boxed set. Nice clean text. -Disclaimer: May have a different cover image than stock photos shows, as well as being a different edition/printing, unless otherwise stated. Please contact us if you're looking for one of these specifically. Your order will ship with FREE Delivery Confirmation (Tracking). We are a family business, and your satisfaction is our goal! Acceptable. Both books in this set have writing on insides of front covers. Paperback The item is fairly worn but still readable. Signs of wear include aesthetic issues such as scratches, worn covers, damaged binding. The item may have identifying markings on it or show other signs of previous use. May have page creases, creased spine, bent cover or markings inside. Packed with care, shipped promptly. New. 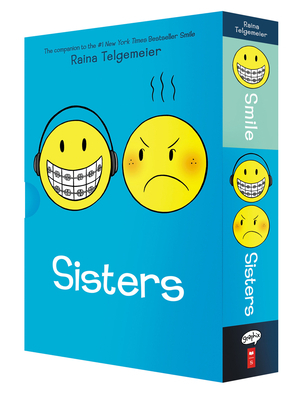 This special boxed set contains Telgemeier's #1 "New York Times"-bestselling and Eisner award-winning graphic memoir "Smile" and its companion, "Sisters". Num Pages: 432 pages. BIC Classification: YBCH; YFW. Category: (J) Children / Juvenile. Dimension: 207 x 149 x 37. Weight in Grams: 780. 2014. Box. Paperback.....We ship daily from our Bookshop.